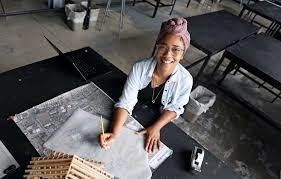 HAMPTON, Va. (Aug 27, 2018) - Hampton University architecture graduate student, Ashley Montgomery, is helping to reduce and manage flooding in individual neighborhoods within Hampton Roads. Through the Sea Level Rise Program at Hampton University and through the Virginia Sea Grant, Montgomery uses basic principles of architecture and many out-of-the-box ways to help neighborhoods prepare for and manage flooding. Montgomery is also one of the leaders of the Coastal Community Design Collaborative (CCDC), a group of student architects, engineers, and marine biologists that develops innovative designs to help Hampton Roads neighborhoods deal with flooding. The CCDC has designed a variety of options to address recurrent flooding, such as installing a wetlands area near a creek bed that floods and planning greenways to break up long stretches of concrete to absorb water. The CCDC group meets once a week throughout the year to brainstorm ideas and flesh out different designs and strategies. Though each project is different, each neighborhood has its own unique feature to consider.